We partnered with Bob’s Red Mill to bring you a Chai Spiced Pecan Pie made using their Organic All Purpose Flour, perfect for your holiday table! Call it Thanksgiving blasphemy but we always find pecan pie a tad too sweet. Plus, we're not huge fans of baking with corn syrup and most pecan pie recipes are loaded with it. Last but not least, we live by the rule that if dessert doesn't include chocolate, it doesn't count. 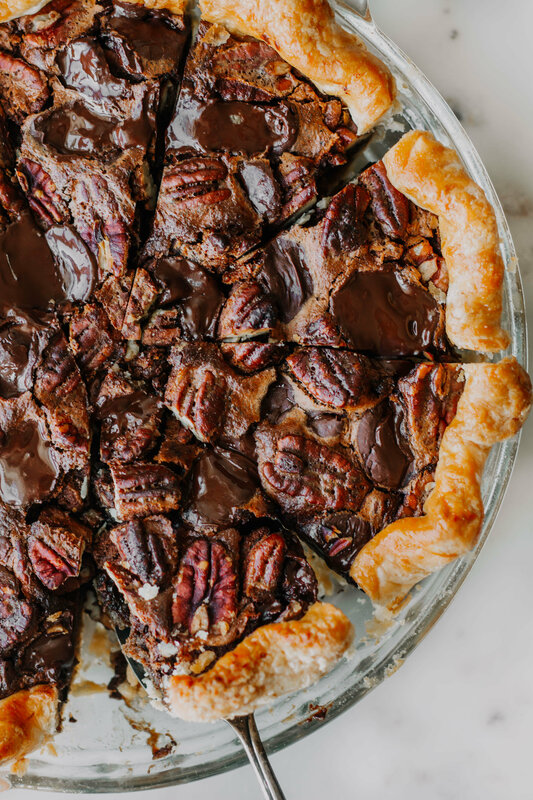 Enter this Chai Spiced Pecan Pie (by our @thesweetandsimplekitchen) to answer all of our pecan pie predicaments. Instead of corn syrup, we used maple syrup. To balance the sickly sweet flavor, we spiced up the filling with warming spices like cinnamon, ginger, nutmeg, cardamom and cloves. To cover off on our chocolate cravings, we added chocolate (both melted and in chip form) to the filling. Voila! Pecan pie #probs solved! Watch us make it here. 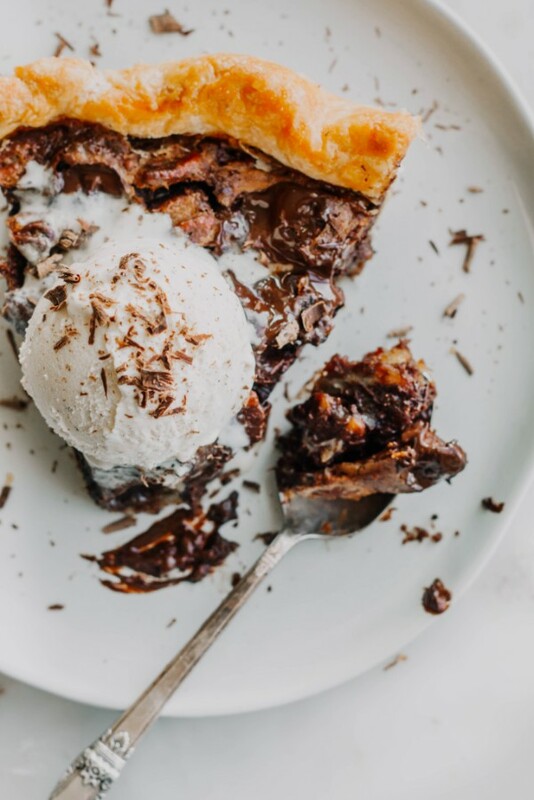 Whether this pie is right up your alley, or you're craving something a little more traditional for your holiday table, we strongly recommend starting with dough made with Bob's Red Mill Organic All Purpose Flour. It's made from freshly milled certified organic wheat and is unbleached and unenriched; because if you are taking the time to bake from scratch you should start with scratch ingredients! Start with frozen butter. We all know the key to flaky layers is cold pie dough, and the best chance you have at keeping the butter cold up until it goes into the oven is to start with frozen butter. Grate the frozen sticks with your cheese grater and they will be a breeze to work into your flour mixture by hand. This tip is particularly useful if you tend to run a little hot as it requires less hands-on manipulation of the dough. Add a little acid to your crust. In this case apple cider vinegar! The notion that this will yield a more tender crust is a little bit of a myth, but it will help to prevent overworking the dough (versus using all water) and it also helps to aid in preventing oxidation of the dough (if you wanted to make it ahead of time). We've also had a lot of success with using vodka in our pie dough (check out that recipe here) as you can use more liquid when mixing the dough, which yields a more hydrated dough (which in turn is easier to work with) without producing too much gluten (i.e. a tough and leathery crust!). Buy a bench scraper. Seriously, it may be one of our favorite tools. It makes bringing the dough together less messy and helps to prevent overworking the dough. Also, when you are done, you can easily scrape all the stuck on mess off of your counter. Take it easy! Let that pie dough rest! Preferably overnight in the fridge, but AT LEAST 1 hour before rolling. Allowing the dough to chill allows the gluten to relax, making the dough easier to roll and shape. If at any time your dough is shrinking or cracking, place it in the fridge for another rest. Use a glass pie plate. We love ceramic too, but if you are a pie newbie, glass will allow you to check the color of the dough to make sure it's not under baked (i.e. soggy). Use common cents. It may sound gross, but pennies make the best pie weights IOHO. Copper conducts heats very well and let's be honest, what else are you going to use them for?Of course you should line the pie with tin foil before adding the pennies to make sure they do not touch the crust. Take care when removing the pennies from the blind-baked crust, they will be very hot! In a large bowl, whisk together all purpose flour, sugar and salt until combined. Add the cold, cubed butter to the flour and gently toss with your hands to coat each piece. Using your fingers or a pastry cutter, work the butter into the flour mixture until pea sized chunks of butter remain, with a remaining few larger pieces about the size of almonds. Remove your water from the fridge and drizzle over the dry ingredients. Use a spatula to gently fold the water into the flour mixture until a shaggy, ragged dough forms. Turn the dough out onto a cool surface (lightly floured if you need it) and gently work the dough with yours hands until it just comes together. Shape the dough into a disk. Wrap with plastic wrap and place in the refrigerator to chill for at least 1 hour or chill overnight. Preheat oven to 425°F. In a large bowl, whisk together eggs, coffee liqueur, maple syrup, brown sugar, melted butter, spices, salt and vanilla until smooth. In a heatproof bowl, melt ½ cup of the chocolate. Whisk into filling mixture. 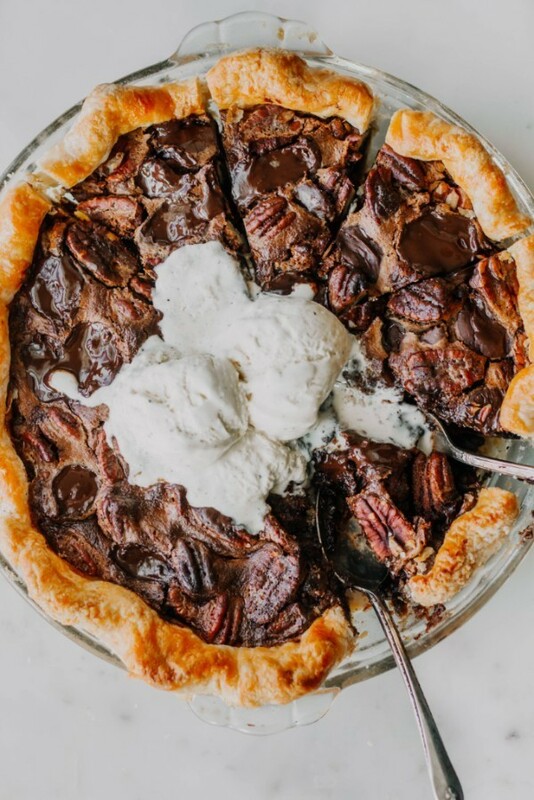 Sprinkle toasted pecans and remaining ½ of the dark chocolate chips into the bottom of your chilled prepared pie shell. * Pour filling mixture over top. Place pie in the bottom ⅓ of your oven and bake for 15 minutes at 425˚F degrees. Reduce heat to 350˚F degrees and bake for an additional 35-40 minutes. *Notes: If desired, reserve some of the pecans to arrange in a concentric circle on top of the pie after you add the filling.